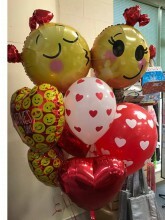 Emojis on balloons! A fun, unique way to send Valentine wishes. This bouquet features a giant Emoji balloon, 2 standard size foil Valentine emoji balloons, a giant 16" latex balloon with printed hearts, and 2 - 11" balloons with printed hearts. What a wonderful surprise for anyone on your Valentine list! Click the button below to add the Balloon Bouquet Emoji Wishes to your wish list.